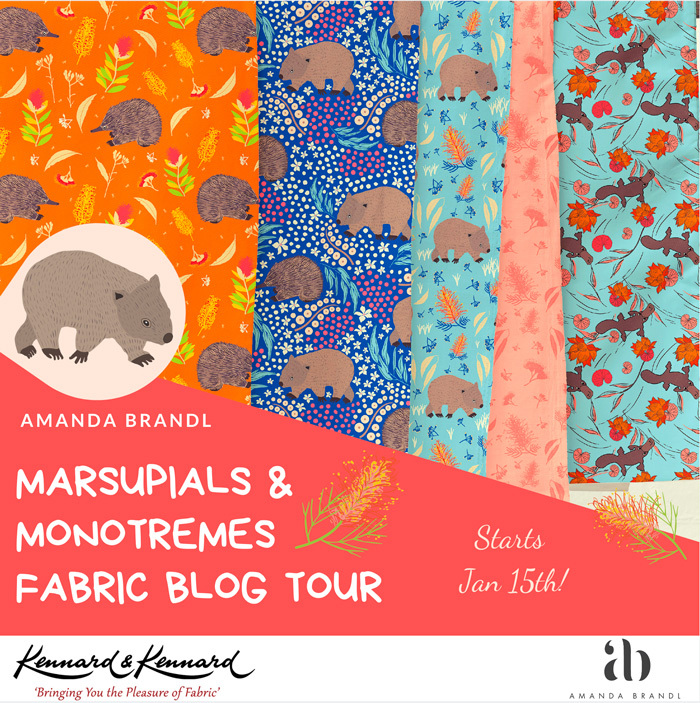 Welcome, welcome, WELCOME to Amanda Brandl's Monotremes & Marsupials Fabric Blog Tour, where you will discover lots of gorgeous Australiana fabric projects in the making! We are so excited to accounts that Amanda brandl's next fabric tour and blog hop begins on the 15th January! Our Australiana collection is so popular in Australia and overseas so follow our social media platforms, as talented makers from all over the world share their projects made from Amanda Brandl's current fabric lines, Monotremes & Marsupials. Check out the full schedule below! Monotremes & Marsupials: View Collection It features platypus, echidnas, wombats and of course native Australian flora... Waratahs, bottle brush and more! Join us each day to follow the blog tour and see the amazing works from many talented ladies sewing with this collection! You can join the fun! Just share you own projects on Facebook, twitter and instagram using the hashtag #Marsupialsandmonotremes. We can’t wait to see what you make! Everyone's blog post will be linked on the day that their project is posted. Please check back here to see the updated blog links added each day!